Studio apartment SA1(3+1). The closest beach is 60 meters away. The property is 40 meters away from the coast. The town center is 50 meters away. FACILITIES AND EQUIPMENT: reception, common terrace for all guest in the property. BEACHES CLOSE TO THE PROPERTY: pebble beach, sandy beach, concrete beach, beach parties. DISTANCES: The distance to the closest beach is 60 meter. The distance to the sea is 40 metar. The property is in the center of the town / place. The property is in the old town center. The distance to the town center is 50 metar. Grocery store - 100 m. Closest restaurant - 50 m. Closest infirmary/hospital - 300 m. Closest public transport (bus etc) - 50 m. Airport - 40 km. Train station - 25 km. Ship / ferry port - 25 km. Nature park - 30 km. National park - 109 km. BASIC FEATURES: Type of studio apartment: SA1. 3 bed/s for adults. Number of extra beds 1. Capacity of the studio apartment (adults) (3+1). The category is 3 star/s. Size of the studio apartment is: 33 m2. The studio apartment is in the attic. Kitchen, living room and beds are in the same space. Flooring in the studio apartment: carpet, parquetry. In the studio apartment is double bed. Studio apartment has one single bed (for one person). Extra bed/s in the studio apartment is/are: one couch/sofabed for one adult. KITCHEN EQUIPMENT: table and chairs, kitchen sink, hob with four cookers, electric hob, oven, refrigerator, tee/coffee machine (filter or espresso), iron. VIEW FROM THE STUDIO APARTMENT: partly seaview, mountain view, panoramic view of the town, studio apartment orientation sea side. BATHROOM: Bathroom size is 4 m2. Equipment in the bathroom: bath tub, toilet, tiles, bath towels. BALCONY/TERRACE (1): Size of balcony in studio apartment is 10 m2. Features and equipment of the balcony/terrace seating set, covered, partly sea view, mountain view, panoramic view of the town. 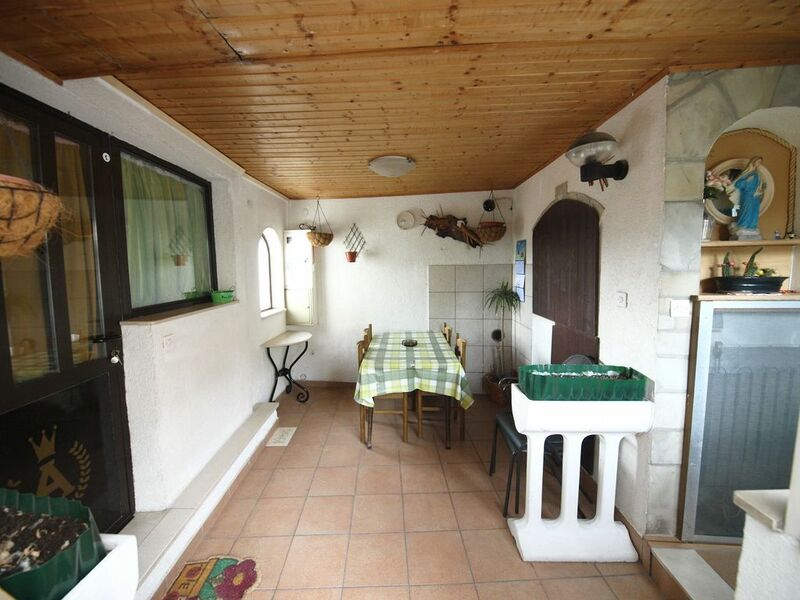 BALCONY/TERRACE (2): Size of balcony in studio apartment is 14 m2. Features and equipment of the balcony/terrace seating set, partly covered, shared balcony/terrace with neighboring accommodation unit, orientation sea side. UNIQUE BENEFITS: reception, common terrace for all guest in the property. BATHROOM : Bathroom size is 4 m2. Equipment in the bathroom: bath tub, toilet, tiles, bath towels.